May 26, 2013 by David Shields. Average Reading Time: about 2 minutes. 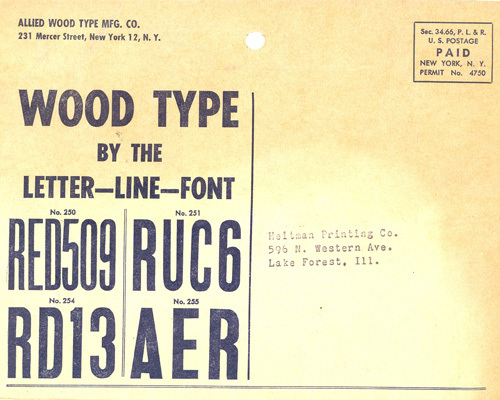 On page 160 and 161 of American Wood Type: 1828–1900 Rob Roy Kelly shows types attributed to Allied Wood Type Manufacturing Company. The samples show cropped specimens of Mode, Stymie, Corvinus Skyline, and Fashion Gothic though all are unfortunately mislabeled and Kelly includes no further attribution or date information, nor does he discuss Allied on any of the corresponding pages. In the 2007 New Vintage Type: Classic Fonts for the Digital Age Steven Heller & Gail Anderson show a scaled full-page image of page 32 from Allied’s 1950 specimen book. This reproduction is also shown without any attribution or date information. As luck would have it, as I began research into tracking down particulars about Allied, the 1950 specimen book came up for auction on eBay. My luck continued as I won the bidding and became the owner of the 60 year old catalog. The specimen book interior is printed in black on off-white uncoated stock, with a 3-color cover. 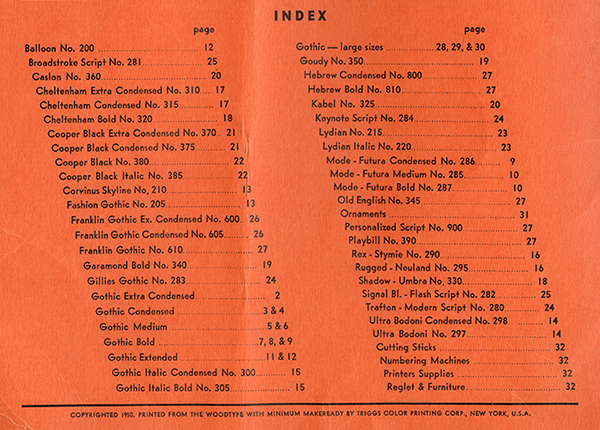 It is 32 saddle-stitched pages plus cover and measures 9 × 11½″, printed “from the wood type with minimum make-ready” by Triggs Color Printing Corp, NYC. Allied’s address is listed as 231 Mercer Street in New York City. 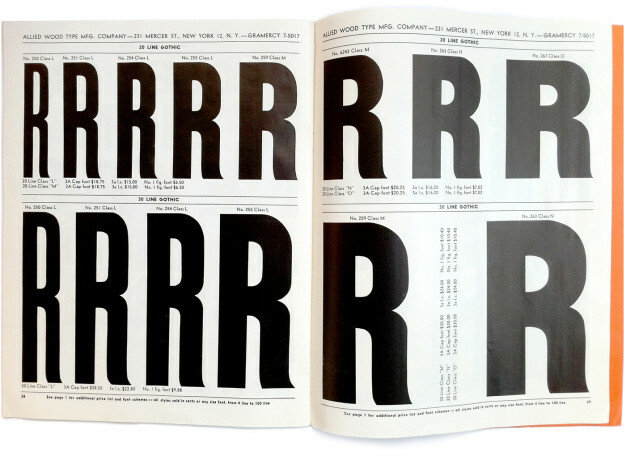 The specimen book includes 45 different type designs, all typical mid-century offerings (Gothics, Brush Scripts, Fat Faces…), in sizes from 4-line to 36-line. The types in the catalog seem different enough—in pricing and style number—from other manufacturers operating at that time which could indicate that Allied was an independent manufacture and not simply a reseller of type. Mr Paul Aken, of the The Platen Press Museum has a copy of a barrel-folded mailer from Allied showing single line specimens each sized at 6-line. Dating the indicia printed on the mailer—thus helping roughly establish the production dates for the mailer—indicates it was produced and mailed sometime between 1948–19541. There are also listings of the company in the International Telephone Book of 1954 and the International Year Book of 1960, both indicating the company held the same address at 231 Mercer Street. No information for Allied has yet been found earlier than 1950 or later than 1960. 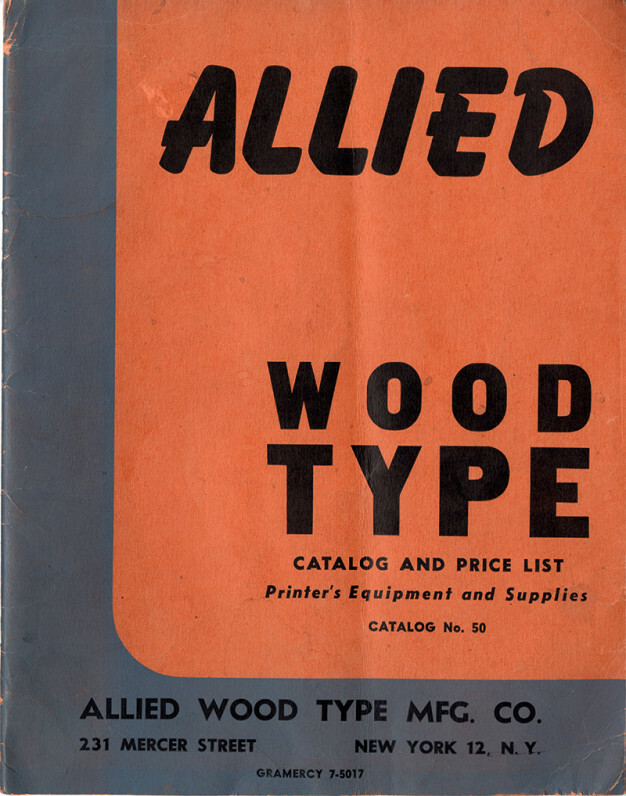 Further research into finding exact dates of Allied’s active operations, names of people associated with the company, existence and location of other specimen catalogs and locating a physical font of type definitively produced by Allied—to check for indications of its physical manufacture—are the next steps to uncovering a clearer story of this mid-20th century American wood type maker.